Patience means waiting nicely and suffering without complaining. God wants us to be patient with others and ourselves. 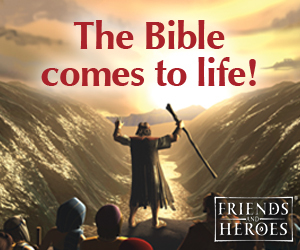 Children learn through Hannah's example how to be patient and to trust God to carry out his plans for their lives. Use yellow paint and mixed with pineapple juice or pineapple scent to make a nice smelling paint. Add a few tablespoons of water to the mix and have your children paint it onto the picture after coloring it with colored pencils. 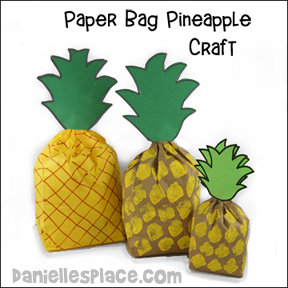 Children stuff newspapers into lunch bags, add construction paper leaves and paint the bag to look like a pineapple. 1. Before class print out the pineapple shapes. 2. 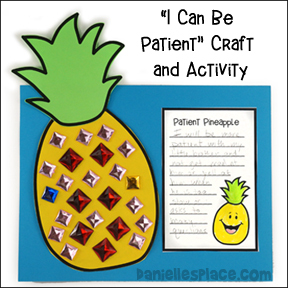 In class have your children decorate the pineapples with craft foam shapes, stickers, buttons, or sequins. 3. When they are done decorating their pineapples have them glue them to one side of a sheet of paper. 4. After the lesson have your children write about a situation in which they have difficulty being patient and how they can be more patient in that situation. 2. Have your children color the picture. As your children work talk about what it means to be patient. 3. Have your children read the quotes on the sheet, and then give examples of when they might have said something like it. Then say what they can do instead to be patient. 4. Tell your children to take their pictures home to remind them to be patient in all situations. You can prepare these ahead of time or have your children help you make them in class. Tell them that you will be using them in a game after the lesson. 1. Before class rip up pieces of newspaper into quarters if you are using newspapers to stuff the pineapples. 2. Print out the pineapple leaf patterns and use them to cut shapes from construction paper. You will need two shapes for each pineapple. 3. In class have your children wrinkle up pieces of newspaper or plastic bags and stuff them in a brown lunch bag. 4. When the bags are full gather the bag at the top and tape closed. 5. Tape one of the leaf shapes onto the top of the bag and then glue the matching shape onto the other side so that the top of the bag is covered. 6. Use small pieces of sponges cut into diamond shapes to paint the pineapples. Have your student dip the sponge shapes into the yellow paint and then press them onto the bags. If you use yellow bags, use brown markers to make stripes. 7. 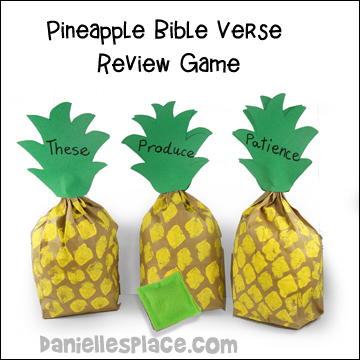 Assign each child one word of the Bible verse to write on the leaves of the pineapples. Make enough pineapples so that you have one for every word of the Bible verse. If you have younger children, you can shorten the verse or use a Bible truth such as: Patience is waiting without getting angry or upset, or patience is suffering without complaining or whining. 8. To play set up all the pineapples in a row to spell out the verse. 9. 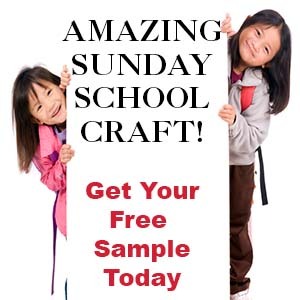 Have your students take turns saying the verse and then throwing a beanbag to knock over one of the bags. 10. When the child has knocked over a pineapple have him say the verse again. 11. Keep playing until all the pineapples have been knocked over. 1. Before class print out the pineapple game pieces and cut them out. 2. Fold up the bottom of the piece so that it is in front of the pineapple picture. 3. Write one word of the verse on the bottom of each pineapple piece. 4. 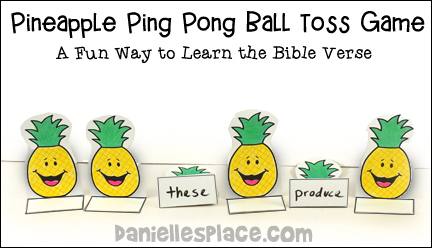 In class have your children take turns throwing a ping pong ball at the pineapples to try and knock them over. If a child knocks over a piece, have him read all the words on the pieces that have been knocked over. Keep playing until all the pieces have been knocked over and the Bible verse is revealed. Bring in a real pineapple that hasn't been cut. In class show your children the pineapple and ask them if they have ever seen the inside of a real pineapple. Explain to them that cutting up a pineapple takes patience but it is worth the wait. Cut off the top and a slice of the pineapple. Show them how you have to cut of the rough outside part and the hard inner part. Cut up the pineapple and place a piece on a plate next to each child. Tell them that they will have to be patient and wait until every child gets a piece. If a child isn't being patient point out to him that he needs to be patient. That means to wait without complaining or whining. When all the children have a piece pray and ask God to help your class to learn patience and then eat up. 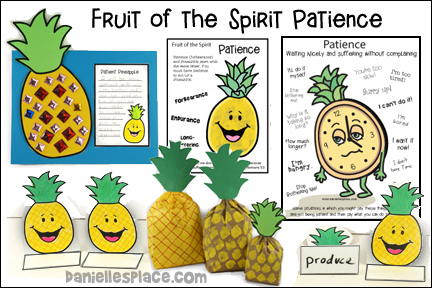 Pineapples can remind us to be patient. Cut out the pictures of the pineapples. (The pattern is available to members only.) The cards say, receive a snack, take another turn, or be patient. Place the cards in a bag and shake them up. Have your children each take a turn pulling a pineapple out of the bag. If a child picks the pineapple that says, "Receive a snack", he gets to go to the table and eat his snack. If it says, "Take another turn", he gets to pick another card out of the bag. If it says, "Be patient", he has to wait until his turn comes around before he can pick another card. Keep playing until all the children have had a snack. Remind your children during the game to be patient. 1. Before class prepare balloons to look like pineapples. Blow up yellow balloons and tape green streamers or crepe paper to the top for the leaves. 2. 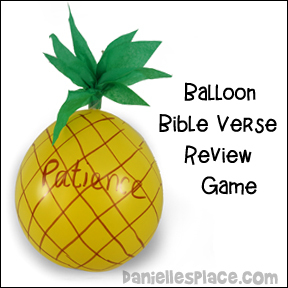 Write one word of the Bible verse on each pineapple balloon. 3. Make newspaper bats by rolling up three sheets of newspapers from corner to corner and tape in the center. Make two or three. 4. In class divide your children up into teams of two or three children. Give the first team the bats. Show your children the balloons and the words written on them. Go over the Bible verse. Write it on the board for younger children who cannot read. Throw the balloons into the center of the room and have the first team see how fast they can line up the balloons next to a wall in order to spell out the verse. They cannot use their hands or feet, just the newspaper bat. 5. After the first team goes let the second team try to beat the first teams time. You can use a real pineapple or one made from a paper bag for this game. Have your children sit in a circle. Place the pineapple in the center of the circle and spin it. The child who has the pineapple leaves pointing towards him, must say the Bible verse and close his eyes until the pineapple is spun again and points to him again. Keep playing until all the children have had a turn to say the verse.